Product prices and availability are accurate as of 2019-03-28 05:45:32 EDT and are subject to change. Any price and availability information displayed on http://www.amazon.com/ at the time of purchase will apply to the purchase of this product. 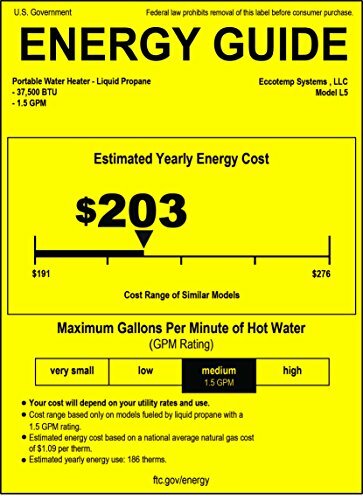 The Eccotemp L5 Portable Tankless Water Heater is the original and best-selling portable water heater on the market today. You get instant, endless hot water wherever you are. 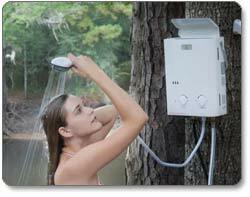 The Eccotemp L5 Portable Tankless Water Heater is perfect for campsites, cabins or simply around the house. Wash your car, wash your boat, take a hot shower, or even wash your horse. You can add the Eccotemp L5 Portable Water Heater to a pressure washer for an even better cleaning. This model includes an electronic ignition powered by 2 "D" cell batteries making it great for off grid or other areas where electricity is not readily available. 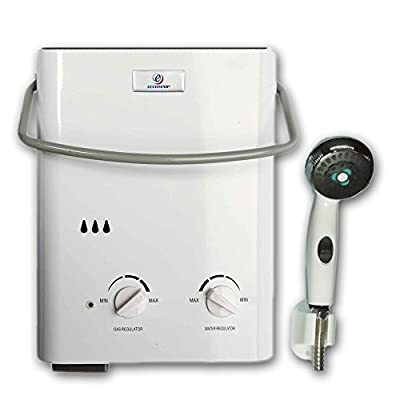 The ideal operating range for the Eccotemp L5 Portable Tankless Water Heater is 20~80 PSI. The system also works great on modified water systems such as a 12-volt pump. 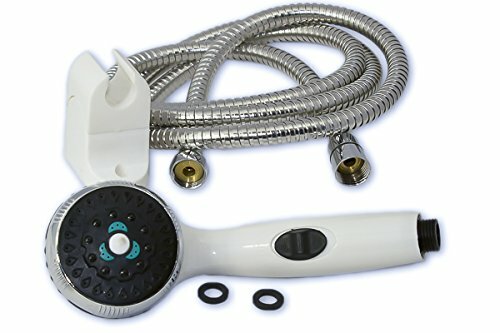 Product Features: Compact & easy to store Light weight Great for camping & family outings Perfect for outdoor showers Easy 3-step setup 20-minute automatic safety shutoff timer Battery powered ignition Manual water temperature controls 30 to 35 degree rise at 1.5 GPM 37,500 BTU Gas Type: Liquid Propane Rated voltage: 3V (D Cell Batteries) Rated gas pressure: 11" of water column Rated heat input: 11kw Eccotemp L5 Dimensions: Height 16.5" Width 11.5" Depth 5.5" Weight approx. 13.8 lbs. Shipping weight 14.7 lbs. Clearance Requirements (at least): 2" clearance from wall 1' on both sides from anything flammable 3' from any window, overhand, awning 18" from the ground What's Included: On/Off shower head Garden hose adapter CSA regulator for use with standard 20 lb. grill propane tank 1 year manufacturer warranty on the unit. IMPORTANT: This is a portable, recreational water heater and should not be permanently installed or plumbed into any fixtures: sinks, showers, etc. When not in use, this water heater should be drained and stored away. This product should also not be used with a bilge pump. Enjoy instant hot water wherever you go with the Eccotemp L5 Portable Tankless Water Heater. Generating more than 1 gallon of hot water per minute, this compact, energy-efficient heater creates a more comfortable and convenient outdoor experience for you and your family. The water heater comes with everything you need, including the adapters required to attach any standard garden hose nozzle and propane tank (tank not included). Compact, portable design supplies hot water whenever and wherever you need it. Ideal for camping trips, at the beach, or rinsing off by the pool. View larger. With all necessary fittings and adapters included, setting up the Eccotemp water heater is a cinch. To operate, the heater connects to a standard garden hose nozzle and propane tank (tank not included). Thanks to its automatic ignition, burners come on as soon as the water flows, so you don't waste a drop. Simply turn on the tap--the heater produces hot water within seconds--and set the temperature to a comfortable level. Choose from multiple spray settings to select your preferred water pressure. The heater provides a temperature range of 80 to 150 degrees Fahrenheit, starting at a .5 gallons per minute (GPM) flow rate and going up to 1.4 GPM. After 20 minutes, the water heater shuts off automatically for added peace of mind. Because the heater's flame ignites by battery, the Eccotemp is a handy backup water source when electricity is not readily available, making it ideal for use in emergency situations, as well as on camping trips. The heater requires two D-cell batteries (not included). The unit requires a minimum of 20 PSI of water pressure and maximum of 100 PSI. This Eccotemp Water Heater is rated for outdoor use only. Eccotemp Systems LLC, located outside of Charleston, SC, manufactures energy-efficient appliances. Eccotemp is committed to technological advances in energy consumption and conservation, and strives to educate consumers on the benefits of energy conservation and products. 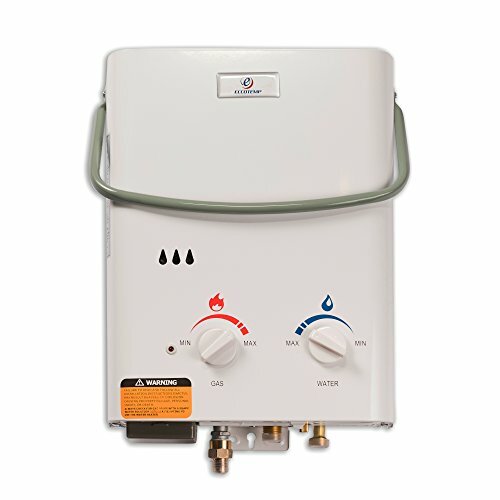 The Eccotemp L5 Portable Tankless Water Heater is backed by a one-year limited warranty on parts, valid while the unit remains at its original point of installation. 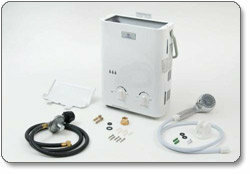 Heater body, vent shield, gas regulator, shower nozzle/hose set, hardware, garden hose adapter, and instruction manual.